If we limit payments to just those below the poverty line, we create perverse incentives, increasing the number of poor people and creating other social problems. If we give everyone money and/or essential services, we create a giant government with losses of freedom and efficiency. What if we were to split the difference? What if we were to give handouts to the poor and the semi-poor, but not to the middle and upper classes? Applying this idea to cash handouts, what we have is Milton Friedman's negative income tax. P/C is our “tax rate.” The original proof of poverty approach is the equivalent of making C=P. The flat entitlement and universal social services approaches are the equivalent to making C go to infinity. While we are talking about a handout instead of an actual tax, P/C has the same incentive effects as an income tax rate. We can apply the same logic as the Laffer Curve to taxes. For the income tax, if we set the rate very low, we collect very little tax, and we also have very little impact on behavior. For a negative income tax, if we set the rate very low, our payout gets very high but we eliminate the perverse incentive on the poor. For an income tax, if we set the rate very high, we collect very little tax because people have no incentive to work. For a negative income tax, a high rate increases our payout by encouraging more people to be poor. When President Kennedy had the top rate cut from 90% to 70%, the government collected more money and the economy surged. The same happened when Reagan cut the top rates further still; however, he overshot the mark a bit when it comes to maximizing government income (which wouldn't be bad if spending were kept under control). Clinton's tax increase did result in more government revenue. Looking at recent history, an income tax rate of around 30% or so appears to be the point of maximum federal revenue. But keep in mind that the income tax is not the only tax, so the Laffer Curve maximum could be higher. Figure 7. Cost and benefit of a negative income tax with a rate of 33%. Note that this is an approximation as I didn't take into account the sloth induced by the 33% rate. 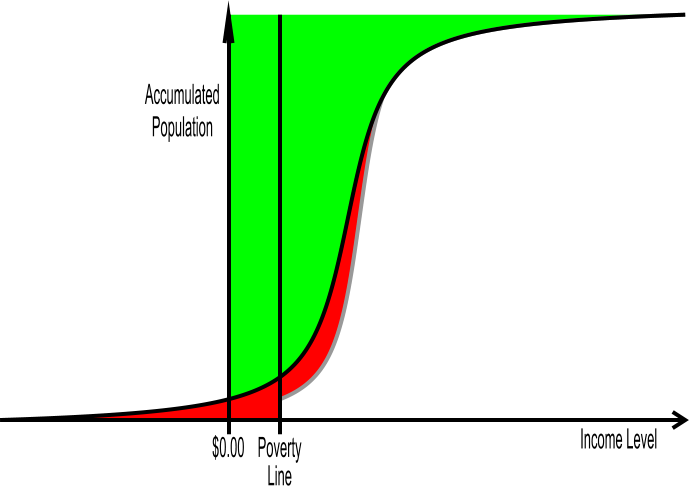 Poor and semi poor people get their incomes boosted up to the line of the right side of the red area. The red area is the cost of such a program. Now, we have a poverty program that begins to look manageable in price, and it gets everyone above the poverty line! The exact price of such a program depends on how many would be below the poverty line without any welfare. If we were to apply the ideas in the previous chapters, this number will be lower since unskilled labor will produce a higher income. The median income might be significantly more than three times the poverty line. Note how this idea boosts the income of those who are a bit above the poverty line. And it does so while preserving the incentives to work, save, spend responsibly, and stay married. In some ways such an approach is more generous than our current system of poverty programs since you don't have to be poor to qualify for some benefit, but if we figure in current middle class entitlements, we could implement such a program while reducing the size and power of government! For example, we could apply this idea to public education, getting half the people completely out of the government system. This could be done either by charging need-based tuition at existing public schools or privatizing the schools and giving out School Stamps based on need (using this fuzzy cut-off). There is an important downside to the fuzzy cut-off approach: it requires knowledge of the incomes of those who would get largesse. With our current personal income tax, this is easy enough, but we freedom lovers hate the personal income tax with a livid passion. It requires a great deal of government surveillance into what should be personal information. With such information, the gods of Washington, D.C. love to play incentive games with the peons. So I do not think this approach is the ultimate long term solution. But as an interim fix to decrease poverty and bureaucracy, this is an excellent approach, and should be immediately applied to many of our current handout programs. Have I really played some trickery? Suppose we had a 33% flat tax rate and then gave everyone a $9000/adult tax refund per year. Would this be any different from the graph above (not counting programs for people with special needs)? On the other hand, consider those government programs that are currently flat payouts for everyone (entitlements): public schools, Social Security, Medicare, etc. How much could total government spending be reduced if these were need based programs with a 33% fuzzy cutoff rate? Free to Choose by Milton and Rose Friedman. This is both a book and a PBS series. See Chapter 4 to see where I first heard of the negative income tax.